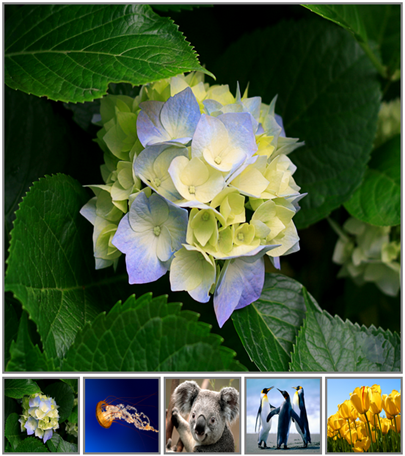 The image gallery should be as shown in the image below. When you click on the image thumnail, the respective image should be displayed in the main section of the page. 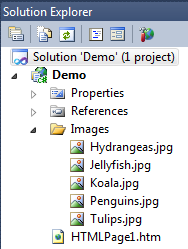 Step 3 : Copy images from C:\Users\Public\Pictures\Sample Pictures to Images folder in your project. <img id="mainImage" style="border:3px solid grey"
changeImageOnClick(event) --- please explain me why we are passing event as a parameter to this function. In C#, you must have noticed that two arguments get passed automatically when you auto generate the button click. One of them is eventArgs that holds some data, some important data I'd say. Same concept is there in JS wherein event variable holds info about the click and target of click and all. your code work fine when I used it inline but its not working when used as external file. Mine worked as expected. Did you include the Js file on your page?